There are carbohydrates that are biscuits, and then there are carbohydrates that are not biscuits. 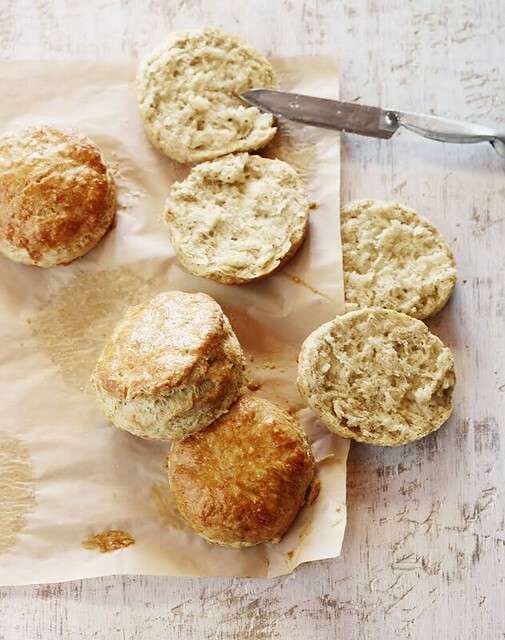 These are biscuits. They are from the new book Fabio's American Home Kitchen: More Than 125 Recipes With an Italian Accent . Look at this guy, I trust his biscuits! Sounds like the perfect holiday weekend breakfast to me! America loves biscuits. I love them with gravy, I love them without. I love biscuits with savory ingredients like roasted ham and sun-dried tomatoes on them. But when you add a lot of black pepper to the biscuits, that’s really taking it to the next level. This is a very simple recipe, perfect for the morning. Preheat the oven to 450°F. Butter a baking sheet. Sift together the flour, baking powder, sugar, salt, baking soda and Parmesan and pepper into a bowl. Work in the butter with your fingers, or pulse in a food processor, until the mixture resembles coarse meal. Mix in buttermilk until just combined. Turn out the dough onto a lightly floured surface and pat into a 7-inch disk about 1 inch thick. Cut out 12 rounds with a floured 2-inch biscuit cutter, collecting and reshaping the scraps as necessary. Arrange the biscuits on the buttered baking sheet. Bake until cooked through and golden brown, 10 to 15 minutes, rotating sheet halfway through. Photo and recipe from Fabio's American Home Kitchen: More Than 125 Recipes With an Italian Accent by Fabio Viviani; published by Hachette Books, a division of the Hachette Book Group. Copyright ©2014 FV Legacy, LLC. All Rights Reserved. Used with Permission.